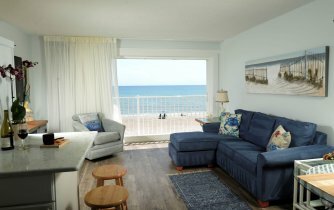 Tuckaway Shores is a vacationer's paradise. Secluded white sandy beaches await right outside when you stay in one of our charming suites along the beach. Enjoy the simple pleasures of Old Florida with comfortable accommodations and friendly service. Our one bedroom suites with fully equipped kitchenettes give you the option of staying in for meals. If you choose to go out, there are plenty of nearby dining options. Tuckaway Shores Resort is close to everything, upscale or casual dining, entertainment, an array of outdoor activities, Kennedy Space Center, and more. Special occasions and events are welcome here, with a private beach entrance, heated pool, Big Green Egg for BBQ’s and a Cabana for small gatherings. Tuckaway Shores is the perfect location for group accommodations and family reunions. We want to make your stay an unforgettable vacation, so let us know how we can assist you.